A match-up between the Washington Wizards and Boston Celtics always brings a bit of intrigue, regardless of win-loss records. This can usually be attributed to the presence of two players: Andray Blatche and Kevin Garnett. The spat is like big brother, little brother, with Blatche once looking up to Garnett as an upcoming player. Many experts also long ago aptly compared the style of both. Well, a comparison in terms of their ability as lengthy big men who can stretch the floor. But that’s pretty much where it ends. Blatche has always lacked something intangibly significant that Garnett has. If you know anything about the game of basketball, you know what I’m talking about. And that’s seemingly what angers the old Celtic most in his face-offs against Blatche, that Andray is not what he should be. The treatment of little brother never ends in a friendly manner. Watch during the game. Garnett will attempt to instigate Blatche out of his mental comfort zone with poking, prodding, talking, and everything in between. Last season, Blatche responded to Garnett’s “wolfing” (or woffing) to the point where it caused some strife between Blatche and his own coach, Flip Saunders. Flip’s main point as one with much experience coaching Garnett: when Andray responds or reacts to any degree, Garnett wins. 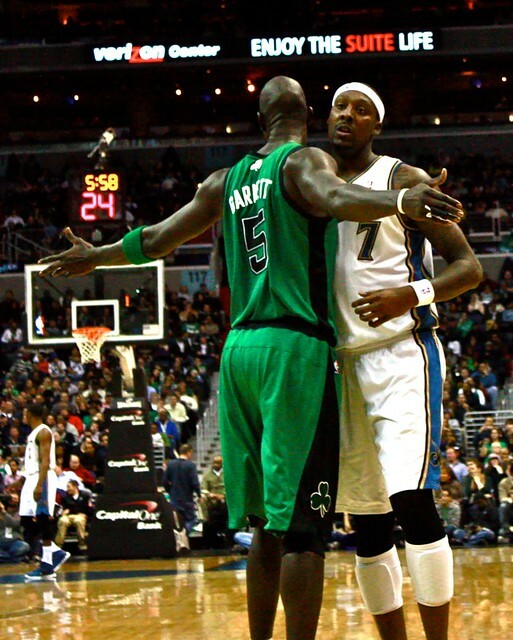 Since, Blatche has tried his best to ignore Garnett’s prickish antics and just play basketball. It hasn’t always worked out, but the Wizards also always seem to be more competitive than expected versus the Celtics, partial credit due to Blatche.